Wow, what a great drawing. 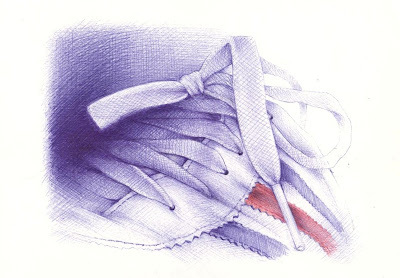 You've gotten such great texture and subtle shading with your pen--wonderful technique and eye for your subject: you've elevated the humble trainer! Ship your pile of rejects to me! I love this - by selecting part of the, uh, shoe, the focus is on all those wonderful lines, and it is very interesting. And, as always, so well done. Funny how that works! We tend to go back to our comfort zone. Don't fight it...you will find inspiration somewhere...your zone is amazing!! a lovely glimpse at the shoe - very nice. Comfort zones are good to go to every now and then - but challenge is good too! You have a thing for shoes. What is it? Andrea, Predictable but wonderful. This is very nice Andrea! Dan, indeed, where is the number for your therapist? Rick, I don't know! I wish I did. I just can't shake it, right now. This is wonderful. I really like the small section you've chosen and love the framing. A beautiful piece!